Kolmino patio is a Parsi/Iranian preparation. 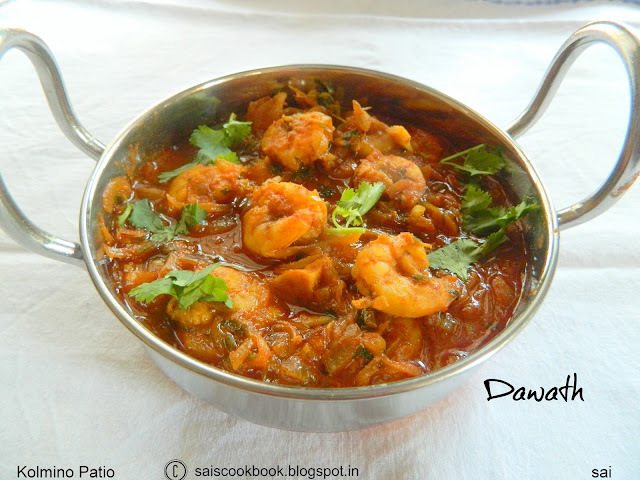 Kolmino patio is basically a sweet and sour prawn curry.I came across this dish from Nutans blog.We were given a task to prepare this dish in the Fb food group on bloggers day by Nutan .I just love trying new recipes and I was happy to see this recipe. Nutan has explained the recipe step wise beautifully. 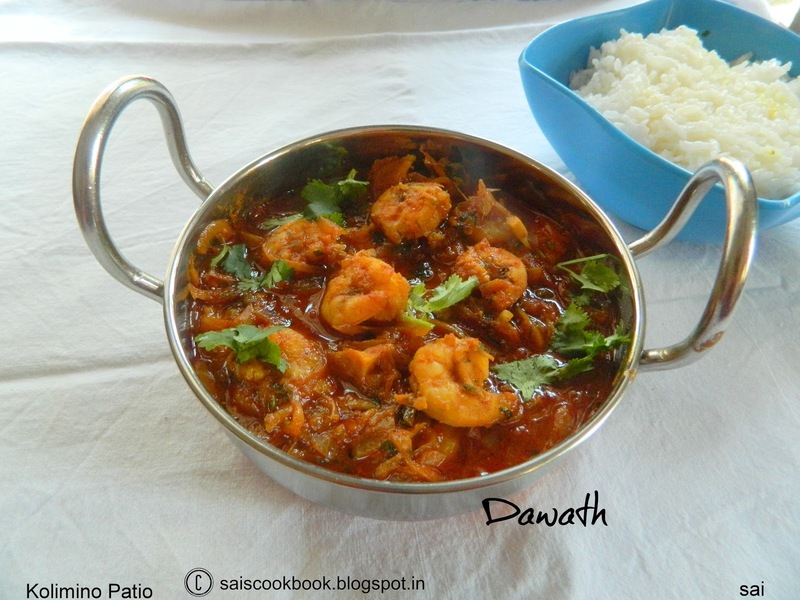 And believe me this dish turned to be a super hit at my place. Only thing I changed in the recipe is I reduced the sweetness since we love spicy curry. Prawns ( big size)- 50 ( shelled, deveined & cleaned ). Onions – 3 ( sliced thinly ). Onions – 8 ( chopped ). Fresh coriander leaves – 1/4 cup. Tamarind – 1 medium sized ball ( soaked in water, pulp extracted ). 1. In a pan heat oil and fry sliced onions till golden brown. 2. Add ground masala,fry well. 3. 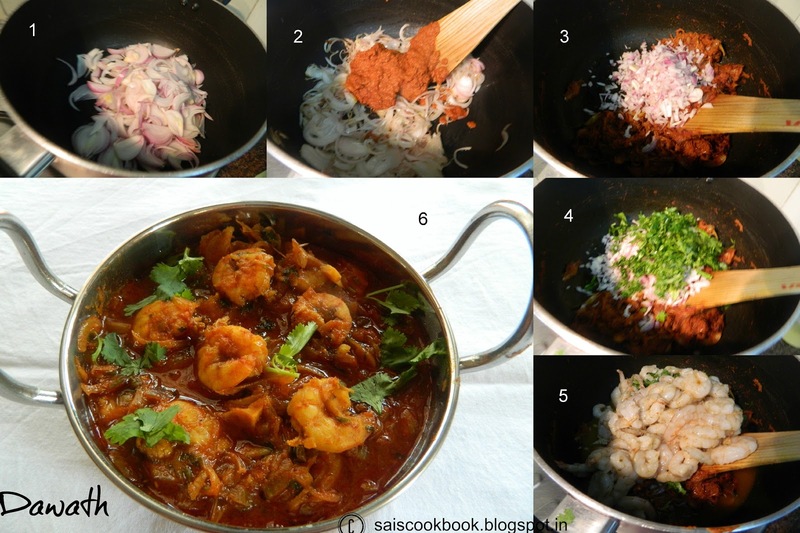 Add prawns & stir well till coated with masala. 4. Add chopped onions, coriander leaves, salt and stir well. 5. Next add water (about 1/2 to 1 cup ) and let prawns cook. 6. Cover and cook till aroma spreads & the masala gets glazy look.